While being near the intersection of “Voznesensky Prospekt” street and the “Fontanka” River in Saint Petersburg, it is impossible not to notice the blue dome of “Izmailovsky Trinity Cathedral”. The church is located at “Troitskaya” Square, at a distance about 700 meters from the metro station “Tehnologichesky Institut”. Built in the Empire style church was consecrated June 6, 1835. At that time the cathedral was the largest in Russia. A special beauty to the church gets its blue dome decorated with gold stars (made under personal instructions of Nicholas I). Close to Trinity Cathedral is column, made of 108 cannons that were compiled in five tiers. This is trophies, Turkish cannons captured during the Russian-Turkish war of 1877-1878. The column was build 12 (24) October, 1886. 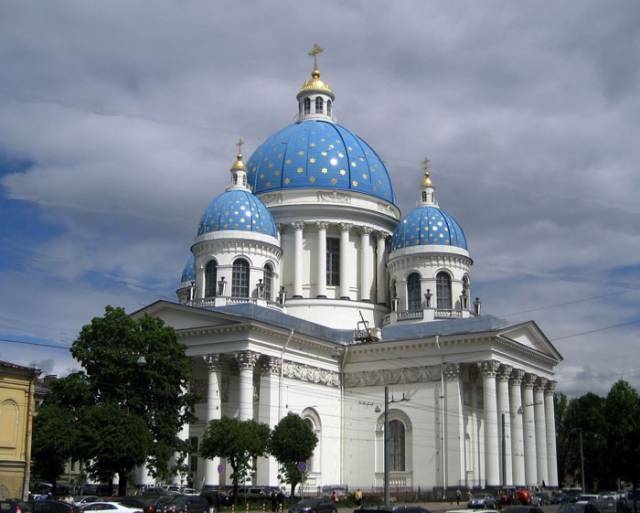 See attractions, museums and interesting places location on the Saint Petersburg map. Submitted by Анонимный on Fri, 04/19/2013 - 09:34. When a church is called a Cathedral the church must the center of the city and it already has all what we need in a church.